Martial Arts students Ranma Saotome and Akane Tendo have been arranged to be married against their will. To make matters worse, after Martial Arts training at the Magical Springs in China, his father is cursed to change into a Panda and he's cursed to change into a beautiful buxom female whenever doused in cold water. (Hot water reverses the effects.) Add to that a cast of characters looking to break up the couple (some of them similarly cursed) and you have one of Rumiko Takahashi's most popular creation as they continue their adventures in the OVA releases. Yikes! I forgot to review this back when I finished it. Oh well, better late than never. When I started watching Ranma ½, it was funny and clever. As time went on, the series began going downhill. While there were a lot of interesting characters that had been added (and some uninteresting ones), by the time the 7th season started, the series had turned dreadfully awful. It was so bad that I didn't think I could stomach any more Ranma-tachi. Fortunately I was talked into watching the OAV series. The one thing the OAV's creators did was go to the original manga for the stories. In the TV series, the manga tales were always the better ones and for the OAV's, it is no exception. The series suddenly felt fresh and new as when I first started watching (some of this can be traced to the fact that the art and animation are so superior to the TV series). Even the old jokes like Akane's cooking, Ryouga-kun's getting lost, or Shampoo's attempts to get Ranma were funny again. Kasumi being possessed by an oni in episode 11 was just a riot. The super-sweet and nice Kasumi suddenly becoming "evil" is something that has to be seen. But then Happosai had to come and and well...ugh! Sadly, the OAV's don't provide any closure to the Ranma-Akane romance, but it did open the potential of a Ryouga-Ukyo romance for fans. There were some sweet moments for Ranma and Akane, but as before, you know there will be no actual real advancement in the romance no matter what. That is still the franchises greatest weakness, but one that Takahashi-sensei seems to love (Maison Ikkoku being an exception to the rule). Bottom line: The OAV's lift the franchise from the depths back to the shining hights where it first began. So if you are a fan who managed to make your way through all seven seasons of the TV series and ended up disappointed, this will lift your spirits for sure. Last updated Sunday, June 05 2005. Created Thursday, June 24 2004. Ranma ½ OVA Hey if you love Ranma this is the best Art stories and animation availble yet. this is the peak of the Ranma universe. If you don't know the Ranma series yet get some of the earlier stuff this will be too confuseing and you won't appreicate it. But for you loyal Ranma fans that don't have it what the heck are you thinking go out and buy this now you won't be disapointed. Last updated Sunday, April 21 2002. Created Sunday, April 21 2002. Regardless, you can never go wrong with this OVA Series. With an actual storyline and great animation, it greatly surpasses the TV series. Nonetheless, you should see at least some of the TV series so you will not be guessing who is who. Must have in any Anime Collection! Ranma ½ OVA I must admit a few things... Courtney is the Queen (or King) of anime reviews... second... I have never seen a Ranma½ OVA and believe it or not... this is the very reason I am writing this! I am a long time reader of Ranma½ Manga and I recently decieded to take my infatuation with Akane to the next level by purchasing Ranma½ DvD OVA box set! it is well past the time it should have arrived and I was starting to get really annoyed that it hadden't arrived yet... when SUPRISE! they (VIS comics) sent me an email saying... "Due to the size of your order, we require credit card verification!" A DVD SET AIN'T THAT BIG! sorry... lemme calm down... ok, I know they mean the price which came to $138.01 with tax and shipping (3 day UPS) but is VIS comics so sad that they coundn't have told me to expect an Email from them... then I mighta checked my email! OH WELL... It'll get here in 3 days now... and it WILL rock! Last updated Wednesday, April 25 2001. Created Wednesday, April 25 2001. 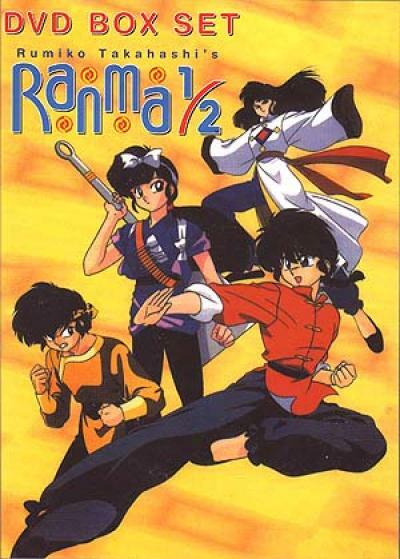 Ranma ½ OVA The OVA's are my favorite series of the Ranma1/2 saga. It has some of the best one or two part stories and has by far the best artwork. There isn't a lot of character development in this series seeing how most of it was done in the 7 year TV series run. So if you haven't seen a lot of the TV series you may get a little lost with all the characters running around, but don't let that stop you watching it. The OVA series takes places after the 7 year TV series and the first two movies. The OVAs of RANMA ½ are the best of Ranma in the highest quality of animation. Im a purist with RANMA since Ive read every last manga of the series written by Rumiko Takahashii and the woman is a comedic genius 9 times out of 10. Her stories are sincerely laugh out loud hilarious to me most of the time and I think the anime is only good when the stories are close (if not perfectly) reproductions of the manga. This is why I like the OVAs best of the RANMA anime because not only is the animation of the highest quality Ive every seen Ranma and co. in but the stories are almost completely Rumiko-sans (and the others are in pretty good spirit of the series) so you're also seeing the character's in their most entertaining light. Ive watched each of these tapes probably 6 times over and I laugh every time. Last updated Tuesday, December 04 2001. Created Sunday, October 22 2000.